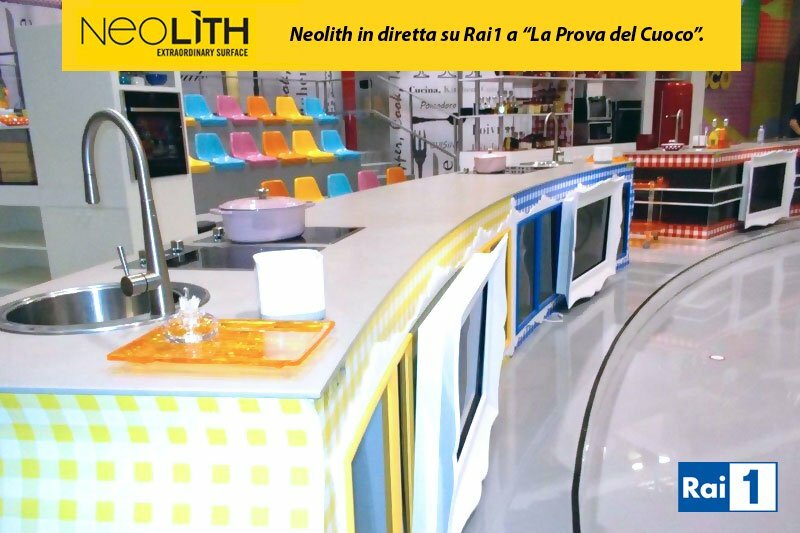 La Prova del Cuoco, one of Italy’s favourite cookery shows, now features seven Neolith worktops as part of a dynamic new set design. The show, hosted by Italian household favourite Antonella Clerici, sees contestants battle it out against each other in the kitchen, partnered with celebrity chefs. First commissioned in 2000, the television series is now in its 16th season which will run until 30th May 2016. The format of La Prova del Cuoco is based on Ready Steady Cook, a British television show. With the show airing six days a week over a nine month period, it was essential that the kitchen worktops were hardwearing and offered surface properties complementary to food preparation and culinary use. The seven worktops feature Pietra di Luna, from Neolith’s Fusion collection, in a Silk Finish.